16 & 32 x 28", 490 hp engine @ 150 rpm; built H.G. Trout, Buffalo, 1897; firebox boiler 10' x 13', 150# steam, 1 water-tight bulkhead. 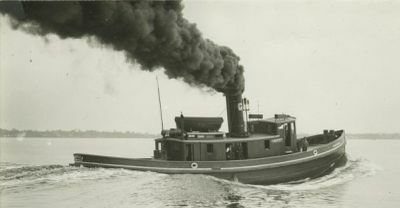 1899 Owned William Hill, James Ash, John Johnson & Abner C. Harding, Hand & Johnson Tug Line, Buffalo, NY. 1916 Great Lakes Towing Co, Cleveland, OH. Undated measurement: 83.2 x 21.2 x 9.6; 93 gross/ 63 net tons. 1941, Oct 23 Sunk Detroit River while assisting freighter B.F. Jones; 6 lives lost. 1950-53 Converted to deisel; 83 x 21.2 x 9.6; 105 gross/71 net tons. 1977, Sep Pilot house damage while assisting freighter FEDERAL ST. CLAIR, Detroit River. 1979, Nov 1 Upper decks damaged by fire, Detroit; Taken to Cleveland for repairs. 1981, Summer Repaired Great Lakes Towing Co., Cleveland.